Herodian of Antioch, History of the Roman Empire (1961) pp.135-152. Book 5. 1. CARACALLA'S life and death have been described in the preceding book. While at Antioch, Macrinus wrote a letter to the senate and the Roman people in which he said the following: 2. "You are familiar with the course of my life from its very beginning. You know my inclination toward uprightness of character, and are aware of the moderation with which I previously managed affairs, when my power and authority were little inferior to that of the emperor himself. For that reason, and since the emperor sees fit to put his trust in the praetorian prefects, I do not think it necessary for me to address you at great length. You know that I did not approve of the emperor's actions. Indeed, I frequently risked my life on your behalf when he listened to random charges and attacked you without mercy. 3. He criticized me harshly too, often publicly complaining about my moderation and my restraint in dealing with those under my authority, and ridiculing me for my easygoing ways and mild manner. He delighted in flatterers and men who encouraged him to cruelty and gave him good reason for his |136 savagery by arousing his anger with slanderous charges. These people he considered his loyal friends. I, on the other hand, have from the beginning been mild, moderate, and agreeable. 4. We brought the war against the Parthians to a conclusion, a critical struggle involving the safety of the whole Roman empire. In our courageous opposition to the Parthians we proved in no way inferior to them, and in signing a treaty of peace we made a loyal friend instead of a dangerous enemy of a great king, who had marched against us at the head of a formidable army. Under my rule all men shall live in peace, and senatorial rule shall replace the autocracy. 5. But let no one think me unworthy of my post, and let no one believe that Fortune blundered in raising me to this position, even though I am of the Equestrian order.1 For what advantage is there in nobility of birth unless it be combined with a beneficent and kindly nature? The gifts of Fortune fall upon the undeserving also, but it is the excellence of his own soul which brings every man his measure of personal glory. Nobility of birth, wealth, and the like are presumed to bring happiness, but, since they are bestowed by someone else, they deserve no praise. 6. Virtue and kindness, on the other hand, besides commanding admiration, win a full measure of praise for anyone who succeeds by his own efforts. What, may I ask, did the noble birth of Commodus profit you ? Or the fact that Caracalla inherited the throne from his father? Indeed, having received the empire as legal heirs, the two youths abused their high office and conducted themselves insolently, as if the empire were their own personal possession by right of inheritance. But those who receive the empire from your hands are eternally in your debt for the favor, and they undertake to repay those who have done them previous good services. 7. The noble ancestry of the highborn emperors leads them to commit insolent acts out of |137 contempt for their subjects, whom they regard as far below them. By contrast, those who come to the throne as a result of temperate behavior treat the post with respect, since they secured it by toil; they continue to show to those who were formerly their superiors the same deference and esteem they were accustomed to show. 8. I intend to have you senators as my associates and assistants in managing the empire, and I intend to do nothing without your approval. You shall live in freedom and security, enjoying the privileges of which you were deprived by your nobly born emperors and which Marcus, of old, and Pertinax, recently, undertook to restore to you; the latter also are emperors who came to the throne from private circumstances. Surely it is better for a man to provide his descendants with the glorious beginnings of a family line than, having inherited ancestral glory, to disgrace it by outrageous behavior." 1. AFTER they heard this message, the cheering senate voted Macrinus all the imperial honors. The fact is, however, that they rejoiced not so much at Macrinus' succession as at their own deliverance from Caracalla. Every man, but especially those who had any claim to merit or distinction, felt that he had escaped a sword suspended over his head. 2. All informers and all slaves who had betrayed their masters were crucified; the city of Rome and virtually the entire Roman empire were purged of these scoundrels. Some were killed, others exiled; any who managed to escape, prudently laid low. As a result, men lived in complete security and in a semblance of freedom during the single year in which Macrinus was emperor. 3. But he made a great mistake in not immediately disbanding the armies, sending the soldiers back to their regular stations, and hurrying off to a Rome eager |138 to welcome him, where the people were shouting for him on every occasion. Instead, he loitered at Antioch, cultivating his beard. He moved with greater deliberation than was necessary, and to those who approached him he made replies that were very slow, difficult to understand, and often inaudible because of the softness of his voice. 4. In doing all this he was imitating Marcus, but he failed to follow that emperor's example in other respects; he indulged in endless luxuries and devoted his time to dancing shows, recitals of every kind of music, and exhibitions of pantomime, while neglecting the administration of the empire. He appeared in public resplendent in brooches and wearing a stomacher lavishly adorned with gold and precious gems, extravagances of which the Roman soldiers did not approve because such ornaments seemed more appropriate to barbarians and women. 5. The soldiers were not at all pleased by what they saw; they disapproved of his way of life as too dissolute for a military man. When they contrasted it with their recollection of Caracalla's daily routine, which, being soldierly and austere, was the exact opposite, they had only contempt for Macrinus' extravagant behavior. 6. Other circumstances increased their irritation; still living in tents and sometimes short of supplies in a foreign land, even though a state of peace seemed to exist, they longed to return to their regular stations. When they saw Macrinus' luxury and laxity, they rebelled and spoke bitterly about him, praying for even a flimsy excuse to rid themselves of this annoyance. 1. 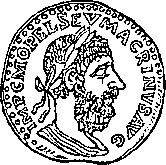 THEREFORE it was inevitable that Macrinus, after ruling for a single year, should lose the empire and his life when Fortune provided the soldiers with a trivial and inadequate excuse for accomplishing their desire. 2. Julia, wife |139 of Severus and mother of Caracalla, had a sister, Maesa, a Phoenician named after the city of Emesa in that country. During her sister's imperial career, the many years that Severus and Caracalla were emperors, this woman lived in the imperial palace. After the assassination of Caracalla and Julia's death, Macrinus ordered Maesa to return to her own estates in Phoenicia, allowing her to live there in full possession of her property. Since Maesa had lived for a long time under imperial protection, she had amassed a huge personal fortune. Thus the old woman now went off to live on her estates. Maesa had two daughters. 3. The elder was called Soaemias; the younger, Mamaea. Each of the girls had an only son: Soaemias' son was named Bassianus; Mamaea's, Alexianus. These boys, who were reared by their mothers and their grandmother, were at that time about fourteen and ten, respectively. 4. They were priests of the sun god, whom their countrymen worship under the Phoenician name Elagabalus.2 A huge temple was erected to this god, lavishly decorated with gold, silver, and costly gems. Not only is this god worshiped by the natives, but all the neighboring rulers and kings send generous and expensive gifts to him each year. 5. No statue made by man in the likeness of the god stands in this temple, as in Greek and Roman temples. The temple does, however, contain a huge black stone with a pointed end and round base in the shape of a cone. The Phoenicians solemnly maintain that this stone came down from Zeus; pointing out certain small figures in relief, they assert that it is an unwrought image of the sun, for naturally this is what they wish to see. 6. Bassianus was the chief priest of this god. (Since he was the elder of the boys, the priesthood had been entrusted to him.) He went about in barbarian dress, wearing long-sleeved purple tunics embroidered with gold which hung to his feet; robes similarly decorated with gold and |140 purple covered his legs from hip to toe, and he wore a crown of varicolored precious gems. 7. Bassianus, in the prime of youth, was the handsomest lad of his time. With physical beauty, bloom of youth, and splendor of attire combining to produce the same effect, the youth might well be compared to the handsome statues of Bacchus. 8. When Bassianus was performing his priestly duties, dancing about the altars in barbarian fashion to the music of flutes, pipes, and every kind of instrument, the natives and the soldiers watched him with more than ordinary curiosity, aware that he belonged to the imperial family. 9. His youthful beauty attracted the eyes of all. At that time a huge army was quartered at Emesa to guard Phoenicia. This army was later transferred from the city, as we shall relate in the pages to follow. The soldiers were therefore frequent visitors in the city and went to the temple on the pretext of worshiping the god; there they delighted in watching Bassianus. 10. Some were deserters and compatriots of Maesa; while they stood admiring the youth, Maesa, either inventing the story or telling the truth, informed them that Bassianus was really the son of Caracalla, although it might appear that he had another father. She claimed that when she was living in the palace with her sister, Caracalla slept with both of her daughters, who were young and beautiful. The men repeated her story to their fellow soldiers, and it soon became common knowledge throughout the army. 11. Maesa was rumored to be enormously wealthy, and it was reported that she would immediately give all her money to the soldiers if they restored the empire to her family. The soldiers agreed that if the family would come secretly to the camp at night, they would open the gates, receive the family inside, and proclaim Bassianus emperor and son of Caracalla. The old woman agreed to the plan, preferring to risk any danger rather than live |141 in obscurity and appear to have been discarded. And so she slipped unnoticed out of the city at night with her daughters and grandsons. 12. Guided by soldiers who had deserted, they came to the wall of the camp and were warmly received inside. Immediately the entire army saluted Bassianus as "Son of Caracalla," and, wrapping him in a purple military cloak, held him inside the camp. Then, bringing in all the supplies from the villages and adjacent fields, together with the women and children, they prepared to endure a siege if it should prove necessary. 1. THESE matters were reported to Macrinus while he was at Antioch, and the rumor quickly spread through the rest of the armies that the son of Caracalla had been found and that the sister of Julia was handing out money. Believing everything that was said and accepting it as true, the soldiers were deeply stirred. 2. They were moved by hatred of Macrinus and pity for the memory of Caracalla; these considerations persuaded them to support a change of emperors. More than any other factor, however, the hope of money influenced their decision, and many soldiers voluntarily deserted to the new Caracalla. Contemptuously dismissing the affair as the efforts of children, and displaying his usual indolence, Macrinus remained at home, but he did send one of the praetorian prefects to Emesa with a contingent of troops which he considered large enough to crush the rebels with the greatest of ease. 3. When Julianus (for this was the prefect's name) arrived and attacked the walls of the camp, the soldiers inside, mounting the towers and battlements, displayed Bassianus to the besieging army; cheering the son of Caracalla, they waved their full purses to induce the attackers to desert. |142 4. Believing that Bassianus was the son of Caracalla and looked exactly like him (for this is what they wanted to see), the besieging soldiers cut off Julianus' head and sent it back to Macrinus; when the gates were opened, all of them were welcomed into the camp. The troops, thus augmented, were sufficient not only to withstand a siege but also to fight a pitched battle at close quarters. The number of those who deserted each day, though they came in small groups, continued to increase the size of the army in the camp. 5. When he learned of these developments, Macrinus assembled all the available troops and marched out to put under siege those who had deserted him for Elagabalus.3 The soldiers of Elagabalus, however, did not wait for the attack. Finding his troops bold enough to march out confidently to engage Macrinus in battle, the youth led them from the city. 6. When the two armies met on the borders of Phoenicia and Syria, Elagabalus' soldiers fought with spirit, fearing that if they should lose, they would suffer for what they had done. The soldiers of Macrinus, on the other hand, were completely indifferent and deserted to Elagabalus. 7. When Macrinus saw what was happening, he was afraid that, having lost all his troops, he would be captured and shamefully treated. While the battle was still raging, he stripped off his purple cloak and other imperial insignia and secretly left the field with a few centurions whom he believed to be especially loyal to him. To avoid recognition he shaved off his beard, donned a traveling cloak, and kept his head covered. 8. He traveled night and day and thus outdistanced the report of his disaster; the centurions drove the chariots at top speed, as if they had been sent by Macrinus, still emperor, on an urgent mission. And so Macrinus fled from the battle. Both armies continued the fight; the bodyguards and spearbearers whom |143 they call praetorians fought for Macrinus, these picked men making a courageous stand against the rest of the army; the remainder of the troops fought for Elagabalus. 9. But when those who were fighting for Macrinus saw neither the emperor nor the imperial emblems for some time, they did not know whether he had been killed or had fled the battlefield, nor did they know what course they should follow under the circumstances. They had no desire to fight for a man who was absent, and were ashamed to surrender and, betrayed, become prisoners of war. 10. Informed by deserters of Macrinus' flight, Elagabalus sent heralds to advise the praetorians that they were fighting vainly for a cowardly fugitive; he solemnly promised them security and amnesty, and offered them service as his bodyguard. Convinced, the praetorians switched their allegiance. Elagabalus then sent men in pursuit of Macrinus, who by that time had fled some distance. 11. The fugitive was finally captured at Chalcedon in Bithynia, desperately ill and exhausted by his continuous flight. His pursuers found him hiding in the outskirts of the city and cut off his head. It is said that he was hurrying to Rome, putting his faith in the people's enthusiastic support; but when he attempted to cross over to Europe by the narrow Propontic Gulf and was already close to Byzantium, they say that the wind was against him and carried him back to Asia and his fate. 12. So, by mischance, Macrinus failed to elude his pursuers and met an ignoble end a little later while striving to get to Rome, where he should have gone in the beginning. Thus he owed his downfall equally to bad judgment and bad luck. 1. NOW the entire army went over to Elagabalus, proclaiming him emperor, and the youth assumed control of the empire. After affairs in the East had been set in order for him by his grandmother and his advisers (for he was young in years, and lacking in education and administrative experience), he delayed his departure for only a short time, as Maesa was eager to return to her familiar imperial life at Rome. 2. The senate and the Roman people were dismayed at the report of these developments, but submitted through necessity because the army had elected to follow this course. They attributed the affair to the indolence and weakness of Macrinus and said that he alone was responsible for what had happened. 3. Leaving Syria, Elagabalus proceeded to Nicomedia, where he was forced by the season of the year to spend the winter. Immediately he plunged into his mad activities, performing for his native god the fantastic rites in which he had been trained from childhood. He wore the richest clothing, draping himself in purple robes embroidered in gold; to his necklaces and bracelets he added a crown, a tiara glittering with gold and jewels. 4. His dress showed the influence of the sacred robe of the Phoenicians and the luxurious garb of the Medes. He loathed Greek and Roman garments because they were made of wool, in his opinion an inferior material; only the Syrian cloth met with his approval. Accompanied by flutes and drums, he went about performing, as it appeared, orgiastic service to his god. 5. When she saw what Elagabalus was doing, Maesa was greatly disturbed and tried again and again to persuade the youth to wear Roman dress when he entered the city to visit the senate. She was afraid that his appearance, obviously |145 foreign and wholly barbaric, would offend those who saw him; they were not used to such garb and considered his ornaments suitable only for women. 6. But Elagabalus had nothing but contempt for the old woman's warnings, nor did anyone else succeed in convincing him. (He would listen only to those who were like him and flattered his faults.) Since, however, he wished the senate and the Roman people to grow accustomed to seeing him in this costume and wished to test their reaction to this exotic sight, before he returned to Rome he had a full-length portrait painted, showing him performing his priestly duties in public. His native god also appeared in the painting; the emperor was depicted sacrificing to him under favorable auspices. 7. Elagabalus sent this picture to Rome to be hung in the center of the senate house, high above the statue of Victory before which each senator burns frankincense and pours a libation of wine upon entering the chamber. He directed all Roman officials who perform public sacrifices to call upon the new god Elagabalus before all the other gods whom they invoke in their rites. By the time the emperor came to Rome presenting the appearance described above, the Romans saw nothing unusual in it, for the painting had prepared them for what to expect. 8. Elagabalus then made the distribution of money customary at the succession of an emperor and staged lavish and extravagant spectacles of every kind. He erected a huge and magnificent temple to his god and surrounded it with numerous altars. Coming forth early each morning, he sacrificed there hecatombs of bulls and a vast number of sheep. These he placed upon the altars and heaped up spices of every kind; he also set before the altars many jars of the oldest and finest wines, so that the streams of blood mingled with streams of wine. 9. Elagabalus danced around the altars to music played on every kind of instrument; women from his own country accompanied him in these dances, carrying cymbals and drums as they |146 circled the altars. The entire senate and all the knights stood watching, like spectators at the theater. The spices and entrails of the sacrificial animals were not carried by servants or men of low birth; 10. rather, they were borne along in gold vessels held on high by the praetorian prefects and the most important magistrates, who wore long-sleeved robes with a broad purple stripe in the center, robes which hung to their feet in the Phoenician style. On their feet were the linen shoes customarily worn by the Eastern prophets. It was obvious that Elagabalus was paying the highest honor to those associated with him in the performance of the sacred rites. 1. EVEN though the emperor seemed to be devoting all his attention to dancing and to his priestly duties, still he found time to execute many famous and wealthy men who were charged with ridiculing and censuring his way of life. He married one of the noblest of the Roman ladies and proclaimed her Augusta;4 but he soon divorced her and, after depriving her of the imperial honors, ordered her to return to private life. 2. So that he might seem to be doing something manly, he made love to one of the Vestal Virgins of Rome, priestesses who are bound by sacred vows to be chaste and remain virgin to the end of their lives; taking the maiden away from Vesta and the holy virgins' quarters, he made her his wife. He sent a letter to the senate asking to be forgiven his impious and adolescent transgression, telling them that he was afflicted with a masculine failing�an overwhelming passion for the maiden. He also informed them that the marriage of a priest and a priestess was both proper and sanctioned. But |147 a short time later he divorced this girl and took yet a third wife, a girl who belonged to the family of Commodus. 3. Not content with making a mockery of human marriage, he even sought a wife for the god whose priest he was. He brought into his own bedroom the statue of Pallas which the Romans worship hidden and unseen. Even though this statue had not been moved from the time when it was first brought from Troy, except when the temple of Vesta was destroyed by fire, Elagabalus moved it now and brought it into the palace to be married to his god. 4. But proclaiming that his god was not pleased by a goddess of war wearing full armor, he sent for the statue of Urania which the Carthaginians and Libyans especially venerate. This statue they say Dido the Phoenician set up at the time when she cut the hide into strips and founded the ancient city of Carthage. The Libyans call this goddess Urania, but the Phoenicians worship her as Astroarche, identifying her with the moon. 5. Claiming that he was arranging a marriage of the sun and the moon, Elagabalus sent for the statue and all the gold in the temple and ordered the Carthaginians to provide, in addition, a huge sum of money for the goddess' dowry. When the statue arrived, he set it up with his god and ordered all men in Rome and throughout Italy to celebrate with lavish feasts and festivals, publicly and privately, in honor of the marriage of the deities. 6. In the suburbs of Rome the emperor built a very large and magnificent temple to which every year in midsummer he brought his god. He staged lavish shows and built race tracks and theaters, believing that chariot races, shows, and countless recitals would please the people, who held night-long feasts and celebrations. He placed the sun god in a chariot adorned with gold and jewels and brought him out from the city to the suburbs. 7. A six-horse chariot bore the sun god, the |148 horses huge and flawlessly white, with expensive gold fittings and rich ornaments. No one held the reins, and no one rode in the chariot; the vehicle was escorted as if the sun god himself were the charioteer. Elagabalus ran backward in front of the chariot, facing the god and holding the horses' reins. He made the whole journey in this reverse fashion, looking up into the face of his god. 8. Since he was unable to see where he was going, his route was paved with gold dust to keep him from stumbling and falling, and bodyguards supported him on each side to protect him from injury. The people ran parallel to him, carrying torches and tossing wreaths and flowers. The statues of all the gods, the costly or sacred offerings in the temples, the imperial ornaments, and valuable heirlooms were carried by the cavalry and the entire Praetorian Guard in honor of the sun god. 9. After thus bringing the god out and placing him in the temple, Elagabalus performed the rites and sacrifices described above; then, climbing to the huge, lofty towers which he had erected, he threw down, indiscriminately, cups of gold and silver, clothing, and cloth of every type to the mob below. He also distributed all kinds of tame animals except swine, which, in accordance with Phoenician custom, he shunned. 10. Many lost their lives in the ensuing scramble, impaled on the soldiers' spears or trampled to death; thus the celebration of the emperor brought tragedy to a host of people. Elagabalus was often seen driving a chariot or dancing. He had no desire to sin in secret, but appeared in public with eyes painted and cheeks rouged; these cosmetics marred a face naturally handsome. 1. OBSERVING his actions, Maesa suspected that the soldiers were outraged by his eccentricities. Fearing that if Elagabalus were killed, she would become a private citizen |149 again, she tried to persuade the youth, who was in every respect an empty-headed young idiot, to adopt as his son and appoint as Caesar his first cousin and her grandson, the child of her other daughter, Mamaea. 2. She told the emperor what it pleased him to hear, that it was clearly necessary for him to have time to attend to the worship and service of his god and to devote himself to the rites and revelries and divine functions, but that there should be another responsible for human affairs, to afford him leisure and freedom from the cares of empire. It was not necessary for him, she said, to look for a stranger or someone not a relative; he should entrust these duties to his own cousin. 3. It was then that the name of Alexianus was changed to Alexander; the name of his grandfather became Alexander the Great, since the Macedonian was very famous and was held in high esteem by the alleged father of them both. Maesa's daughters, and the old woman too, boasted of their adultery with Caracalla, son of Severus, in order to increase the soldiers' love for the youths, who thus appeared to be Caracalla's sons. 4. Alexander was then appointed Caesar and served as consul with Elagabalus himself. Appearing before the senate, Elagabalus confirmed this appointment, and all the senators voted approval of the fantastic and ridiculous situation they were ordered to endorse�that the emperor, who was about sixteen, assume the role of father to Alexander, who was twelve. After adopting Alexander as Caesar, Elagabalus undertook to teach him his own practices; he instructed him in dancing and prancing, and, enrolling him in the priesthood, wanted the lad to imitate his appearance and actions. 5. But his mother Mamaea kept Alexander from taking part in activities so disgraceful and unworthy of an emperor. Privately, she summoned teachers of every subject and had her son trained in the lessons of self-discipline; since he devoted himself to wrestling and to physical exercise as well, he was, by his |150 mother's efforts, educated according to both the Greek and the Roman systems. Elagabalus, much annoyed at this, regretted his decision to make Alexander his son and partner in the empire. 6. He therefore banished Alexander's teachers from the imperial palace; he put to death some of the most distinguished and sent others into exile. The emperor offered the most absurd excuses for doing this, claiming that these men, by teaching Alexander self-control, educating him in human affairs, and refusing to allow him to dance and take part in the frenzied orgies, would corrupt his adopted son. The madness of Elagabalus increased to such a degree that he appointed all the actors from the stage and the public theaters to the most important posts in the empire, selecting as his praetorian prefect a man who had from childhood danced publicly in the Roman theater. 7. He elevated in similar fashion another young actor, putting him in charge of the education and conduct of the Roman youths and of the qualifications of those appointed to membership in the senatorial and Equestrian orders. To charioteers, comedians, and actors of mimes he entrusted the most important and responsible imperial posts. To slaves and freedmen, to men notorious for disgraceful acts, he assigned the proconsular provincial governorships. 1. WITH everything that formerly had been held sacred being done in a frenzy of arrogance and madness, all the Romans, especially the praetorians, were angered and disgusted. They were annoyed when they saw the emperor, his face painted more elaborately than that of any modest woman, dancing in luxurious robes and effeminately adorned with gold necklaces. 2. As a result, they were more favorably disposed toward Alexander, for they expected great things of |151 a lad so properly and modestly reared. They kept continual watch upon the youth when they saw that Elagabalus was plotting against him. His mother Mamaea did not allow her son to touch any food or drink sent by the emperor, nor did Alexander use the cupbearers or cooks employed in the palace or those who happened to be in their mutual service; only those chosen by his mother, those who seemed most trustworthy, were allowed to handle Alexander's food. 3. Mamaea secretly distributed money to the praetorians to win their good will for her son; it was to gold that the praetorians were particularly devoted. When he learned this, Elagabalus plotted against Alexander and his mother in every conceivable way, but Maesa, the grandmother of them both, foiled all his schemes; she was astute in every way and had spent much of her life in the imperial palace. As the sister of Severus' wife Julia, Maesa had always lived with the empress at the court. 4. Therefore, none of Elagabalus' schemes escaped her attention, for the emperor was careless by nature, and his intrigues were always obvious. Since his plots failed, the emperor undertook to strip Alexander of the honor of Caesar, and the youth was no longer to be seen at public addresses or in public processions. 5. But the soldiers called for Alexander and were angry because he had been removed from his imperial post. Elagabalus circulated a rumor that Alexander was dying, to see how the praetorians would react to the news. When they did not see the youth, the praetorians were deeply grieved and enraged by the report; they refused to send the regular contingent of guards to the emperor and remained in the camp, demanding to see Alexander in the temple there. 6. Thoroughly frightened, Elagabalus placed Alexander in the imperial litter, which was richly decorated with gold and precious gems, and set out with him for the praetorian camp. The guards opened the gates and, receiving them inside, brought the two |152 youths to the temple in the camp. 7. They welcomed Alexander with enthusiastic cheers, but ignored the emperor. Fuming at this treatment, although he spent the night in the camp, Elagabalus unleashed the fury of his wrath against the praetorians. He ordered the arrest and punishment of the guards who had cheered Alexander openly and enthusiastically, pretending that these were responsible for the revolt and uproar. 8. The praetorians were enraged by this order; since they had other reasons, also, for hating Elagabalus, they wished now to rid themselves of so disgraceful an emperor, and believed, too, that they should rescue the praetorians under arrest. Considering the occasion ideal and the provocation just, they killed Elagabalus and his mother Soaemias (for she was in the camp as Augusta and as his mother), together with all his attendants who were seized in the camp and who seemed to be his associates and companions in evil.5 9. They gave the bodies of Elagabalus and Soaemias to those who wanted to drag them about and abuse them; when the bodies had been dragged throughout the city, the mutilated corpses were thrown into the public sewer which flows into the Tiber. 10. After having ruled the empire for more than five years, leading the kind of life described above, Elagabalus perished in this manner together with his mother. The praetorians then proclaimed Alexander emperor and conducted him into the palace while he was still a youth and still being given a thorough education by his mother and his grandmother. 1. 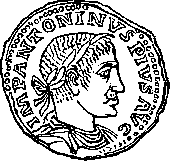 1 Macrinus was the first emperor who was not of the senatorial order. 2. 2 The Baal of Emesa. The spelling of "Elagabalus" varies. 3. 3 I have regularly substituted for "Antoninus" the more familiar "Elagabalus." 4. 4 After the Flavian era this title was normally conferred upon the wife of the reigning emperor. 5. 5 March 12, 222.